Many have compared Friends of Golf’s (FOG) support of collegiate golf to the role New York’s Downtown Athletic Club played in college football and the Heisman Trophy. In 2010, FOG’s commitment to college golf earned the organization the Golf Coaches Association of America’s Lifetime Achievement Award. They were the first organization and only the fifth recipient of the prestigious award with the other four being Arnold Palmer, Byron Nelson, Jack Nicklaus and Karsten Solheim. In 1989, FOG board member and 1940 Heisman Trophy winner, Tom Harmon and his friend Ben Hogan established the Ben Hogan Trophy recognizing each year’s outstanding college golfer. Harmon was a true American hero and one of the most famous athletes of his generation. Following his storied University of Michigan football career and being the NFL’s overall #1 draft pick, he enlisted in the Army Air Corp as a fighter pilot. During WWII, he survived a crash in South America before being shot down over Japanese-occupied China and receiving a Purple Heart and a Silver Star. In spite of his accomplishments, he’s best known today as the father of Mark Harmon, former UCLA quarterback and star of NCIS, America’s #1 rated television show. FOG supports student athlete golfers from the time boys and girls enter grade school through the end of their college experience. Regardless of economic standing, FOG has made it possible for aspiring junior golfers to play, compete and excel in this exceptional sport that instills the values of honesty, ethics, and fellowship. FOG was founded in 1978 by legendary UCLA golf coach Eddie Merrins and billionaire philanthropist, John Anderson, but over the years has included names like Peter Ueberroth, Ken Venturi, Carroll Shelby, John Wooden, Dinah Shore, Digger Phelps, Johnny Miller, Jim Nantz, Al Michaels and many more. In addition to its high profile at the college level, FOG has donated over $8 million to youth golf organizations at all levels. FOG’s Turn Wood and Iron into Gold program collects used golf equipment and donates it to boys and girls high school golf teams. In their “thank you” letters, many coaches and administrators tell us their programs wouldn’t exist without FOG’s support. 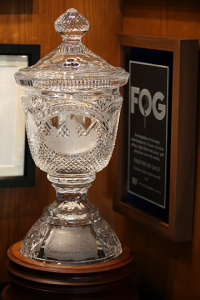 FOG’s fund raising centers around its one day tournament held annually at the Bel-Air Country Club in Los Angeles; a day once heralded by Byron Nelson as “the finest one day tournament of its kind in the country”. The event includes morning and afternoon shotgun starts, one-of-a-kind live and silent auction items and a star-filled dinner and awards banquet that features an annual Honoree. FOG’s past Honorees have combined to win over 120 major golf championships and include names like Nicklaus, Palmer, Sorenstam, Whitworth, Trevino, Mickelson, Player, Nelson and many more golfing greats. Throughout the years Tournament Day has produced memorable moments. As a high school junior, Tiger Woods met Jack Nicklaus for the first time while playing in FOG’s one day tournament and Ernie Els captured the British Open several weeks after serving as FOG’s 2012 Honoree. For additional information regarding FOG sponsorship opportunities, tournament participation, FOG’s Turn Wood and Iron into Gold program or donating to the future of golf, visit www.friendsofgolf.org or call 877-551-4FOG(4364).